The latest military research project looks to leap the final gap between video games and real-life war. 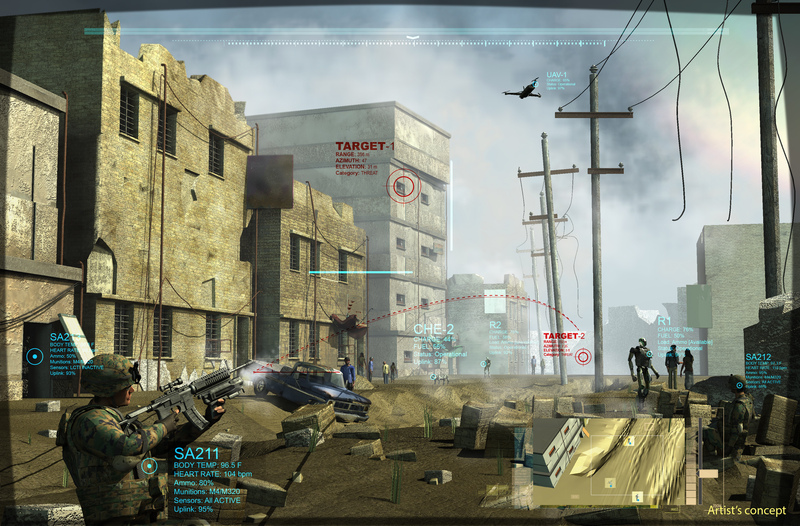 The Defense Advanced Research Projects Agency just awarded contracts for its new Squad X Core Technologies program, which would hypothetically use augmented reality to give military infantry a leg up when they&apos;re on the ground in a war zone. 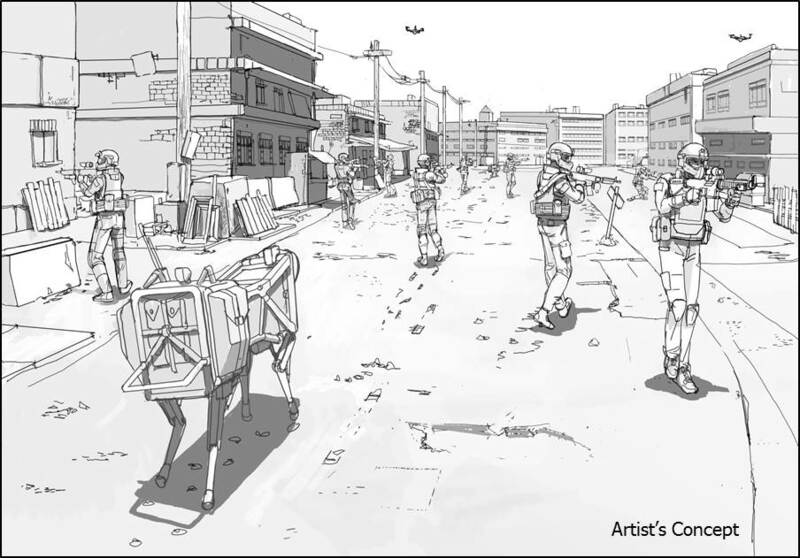 The concept mockup features soldiers in a rundown city that looks an awful lot like a Counter-Strike or Call of Duty video game map. It shows what you&apos;d see in most first-person shooter games: overlaid displays on both friendly and enemy combatants, visible data like body temperature, remaining ammunition and type of ammunition. Unfortunately, soldiers already carry about 60 to 100 pounds of equipment in the field, and adding complex computing systems would just add strain. Major Christopher Orlowski, DARPA program manager, looked for ways to relieve some of that strain back in June during DARPA&apos;s Biology Is Technology conference, starting with the HULC Exoskeleton system. But the new idea isn&apos;t to make soldiers capable of carrying heavier loads. it would be to make them more present when it&apos;s time to go to battle. DARPA wants to create the soldier of the future — with the technological awareness of a cyborg yogi. "Our goal is to develop technologies that support a three-dimensional, common-operating, picture-leveraging input from integrated mobile sensors, as well as the ability to organically locate and identify friendly forces and threat locations in near-real time," said Orlowski, according to a DARPA release. (He&apos;s describing, basically, the screen you see in a first-person shooter — but with sensors attached to fellow soldiers.) "The Phase 1 performers for SXCT have proposed a variety of technologies that, in the future, could provide unprecedented awareness, adaptability and flexibility to dismounted soldiers and Marines, and enable squad members to more intuitively understand and control their complex mission environments." The first round of contracts have already gone to Lockheed Martin, Helios Remote Sensing Systems, Raytheon (possibly best known for its heat ray) and others in both military and technology sectors. The idea of war looking more like a video game is scary, sure, especially for people worried about video games desensitizing players to real-life violence. However, this is a similar concept to what the Air Force and Navy already use in war: methods for working more efficiently, plus the ability to constantly monitor enemies and to assess the safety of fellow soldiers who might be in danger. Based on Orlowski&apos;s technical parameters for the new technology, the SXCT program should let soldiers engage combatants from a little over half a mile away, keep tabs on their squad&apos;s location even when GPS wouldn&apos;t normally be accessible and even move with "occasional bursts of speed" to engage enemies. In other words, DARPA wants to create the soldier of the future — with the technological awareness of a cyborg yogi. "SXCT aims to help dismounted infantry squads have deep awareness of what&apos;s around them, detect threats from farther away and, when necessary, engage adversaries more quickly and precisely than ever before," Orlowski said in the release. "We are working toward advanced capabilities that would make dismounted infantry squads more adaptable, safe and effective."